The recent war between Hamas and Israel has once again unleashed a global wave of antisemitism that all too many people who should know better try to downplay as mere “anti-Zionism” or justified “criticism” of Israel’s policies and conduct. But while we may pay more attention to this phenomenon when it makes the news because of massive demonstrations, the pernicious notion that it is somehow “understandable” when people express antisemitic resentments while claiming to protest Israeli policies and that therefore, Israel is ultimately to blame for spikes in global antisemitism, has long been promoted by anti-Israel activists who have an obvious interest in whitewashing the antisemitism that is so prevalent in their circles. As I have repeatedly argued, it should be obvious that if antisemitism can be “justified” by Israeli policies, any other bigotry can also be justified by employing a similar “reasoning.” It is therefore particularly disheartening to see that the Israeli left’s flagship paper Ha’aretz keeps publishing op-eds that promote endless variations of the argument that Israel causes “understandable” antisemitism. In late May, I wrote about this on my JPost blog (now cross-posted below) and I just noticed that Ha’aretz published recently yet another variation on this theme by Dmitry Shumsky. Tellingly, Shumsky’s preposterous piece starts out with the utterly misleading assertion that “Theodor Herzl, the founder of political Zionism, cited the socioeconomic and political failure of Europe’s Jews to integrate into the non-Jewish environment as the cause of modern anti-Semitism.” So you see, even Herzl felt that antisemitism was caused by the failure of the Jews “to integrate into the non-Jewish environment”… Good news for Muslim-haters in Europe and elsewhere: as long as you feel that Muslim minorities in your country fail to integrate into the non-Muslim environment, you’re most welcome to indulge into anti-Muslim bigotry, discrimination and persecution to your heart’s content. The same applies to anyone in the US who feels that blacks haven’t properly integrated into the non-black environment, or that Hispanics haven’t really integrated into the non-Hispanic environment – hate these people all you want, because after all, your hate is justified by their failure to integrate. 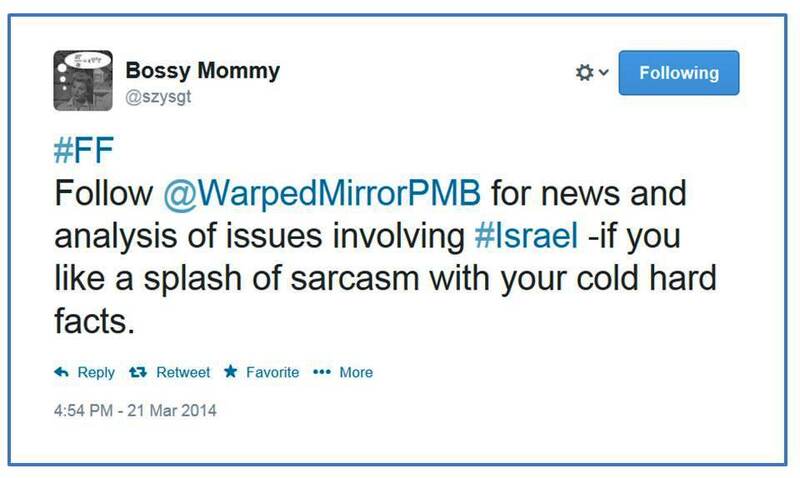 As far as Shumsky is concerned, today’s collective Jew Israel “is not discriminated against in the family of nations. On the contrary. It is given preferential treatment and benefits from privilege” and thus there is no reason to be surprised “that a country that enjoys privilege in the international community has awakened large, ongoing waves of hatred against itself.” Since Shumsky doesn’t tell us exactly what “preferential treatment” and “privilege” Israel enjoys in “the family of nations,” i.e. the UN, we are left to speculate which parts of the UN “network of anti-Israel institutions” Shumsky has in mind. Right, Miss Landsmann: maybe Jews can pretend for a while to be different than they really are, but truly, who would want anything to do with them once it becomes clear who the Jews really are? 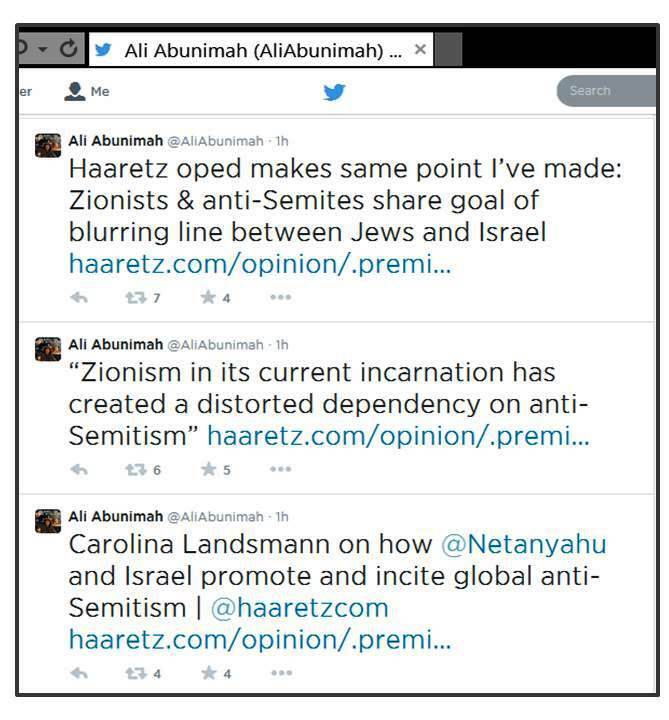 This is a well-deserved compliment for Carolina Landsmann given Abunimah’s Orwellian definition of antisemitism which is based on his view that Zionism is “one of the worst forms of anti-Semitism in existence today” and that it is comparable to Nazism. 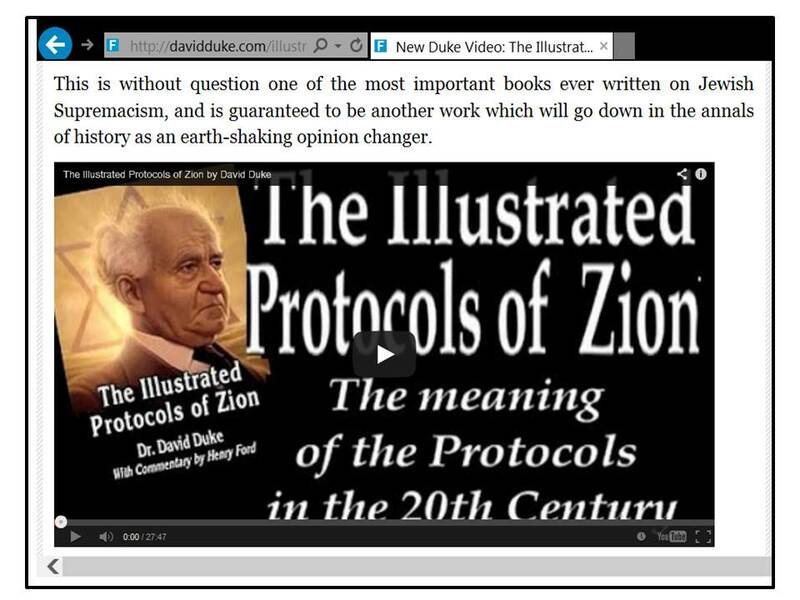 Unsurprisingly, Abunimah’s stance has been warmly endorsed on David Duke’s website – where they are currently working hard on “The Illustrated Protocols of Zion.” Landsmann’s article would certainly qualify as useful source material for this project. In their eagerness to justify antisemitism, the Ha’aretz writers inevitably provided a general justification for bigotry: Have you or anyone you know ever been harmed in any way by a Muslim/Arab/immigrant? If so, it’s fine to hate Muslims/Arabs/immigrants – and if anyone calls you a racist, tell them that the political correctness of your bigotry has been certified by Israel’s famously progressive paper Ha’aretz. 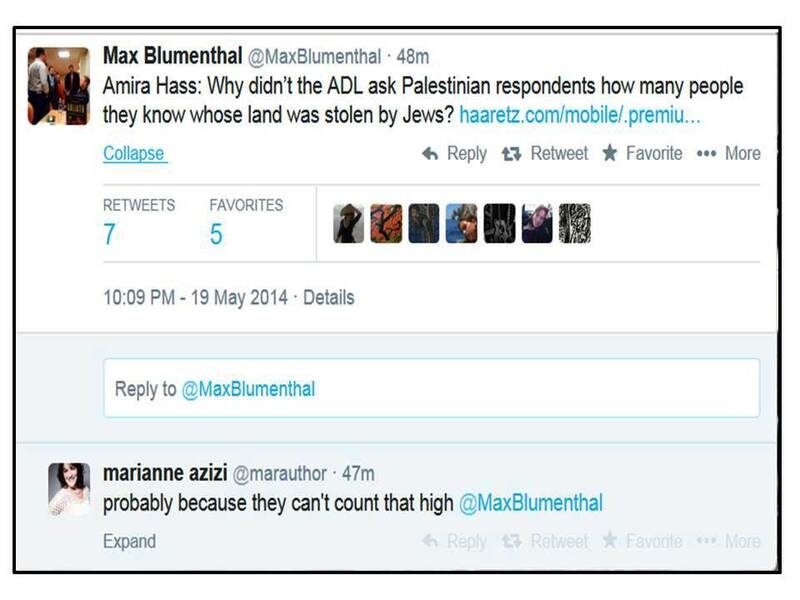 This entry was posted in Uncategorized and tagged Ali Abunimah, antisemitism, David Duke, Israel, Max Blumenthal. Bookmark the permalink. Oh dear, here we go again! It matters not how often the well known social science concept of “blaming the victim” is brought out in front of these people, they still fail to learn. Throughout history, the victimiser continually blames the victim for their (the oppressor’s) behaviour. “If only the (victim – name your own) would behave better, then all would be well!” In reality, of course, it doesn’t matter what the victim does, the oppressor will always find reasons to oppress them. A year or two back, I noted how Anthony Lerman, political scientist and twice Director of the (UK) Jewish Public Policy Research unit, has asserted that if only British Jews would stop being so pro-Israel, then antisemitism in the UYK would subside. In his dreams. And I got attacked for it by one particular commenter, who clearly felt that I had made an ad hominem attack on Lerman for stating the truth that he was, again, blaming the victim. The surprise is not that victims (be they the writers at Ha’aretz or top – Jewish – social scientists) keep saying this, but that they are not attacked more vigorously for what they say by the rest of us. Frankly, I totally fail to understand how supposedly intelligent people don’t realize that their efforts to “explain” or “justify” antisemitism can be used to do the same with any other type of bigotry. And of course I know that Lerman is into this, too.